Rights groups have criticised the move to bathe New York's Empire State Building in red and yellow in honour of communist China's 60th anniversary. Managers of the building said the lights were to honour the Chinese people, adding that they celebrated many cultures and causes in such a way. But Human Rights Watch, which has offices in the building, voiced dismay. The group objected to celebrating the Communist Party, whose rule it said had seen many rights abuses. "We have no objection to honouring China as a nation, a great civilisation or a vibrant people," HRW associate director Carrroll Bogert said in a letter to the Empire State's management. "However, this date commemorates the rule of the Chinese Communist Party, a political entity that is responsible historically for many grave violations of human rights." On Thursday, China staged mass celebrations to mark 60 years since the Communist Party came to power. Some 30,000 people were invited to watch the events in person, but others were encouraged to stay at home and watch the festivities on TV to "avoid complications". 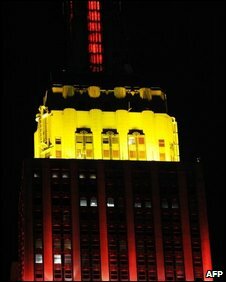 Human Rights in China, another group with offices in the Empire State Building, also criticised the illuminations. "This anniversary has been accompanied by massive rights abuses," Sharon Hom, the group's executive director, was quoted as saying by the New York Times. The lights on the building change in honour of many events during the year, including St Patrick's Day, Australia Day and India Day. A spokeswoman for the Empire State Building, which receives hundreds of requests a year, told Reuters that no fee was charged to have specific lights and that there was an application form. "All special lighting requests are considered based on the merit of their cause, the benefit of their use of the special lighting and their treatment of the Empire State Building's iconic image for the event and on an ongoing basis," the building's website says.